Best Case/Worst Case lays out possible scenarios for broadcast primetime TV seasons yet to premiere. Here's what's premiering tonight. In a Nutshell: The CW finally returns to drama programming tonight. 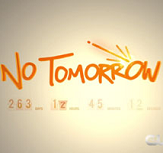 The network hopes that 9/8c newbie No Tomorrow will be the latest entry in its recent CBS Studios dramedy tradition, following Jane the Virgin and Crazy Ex-Girlfriend from the last two seasons. They're certainly trying to make it work, putting it directly after the massive (yet seemingly incompatible) The Flash. It also gets only one broadcast program as competition tonight, a four-way simulcast of the vice presidential debate. Best Case: The best thing going for No Tomorrow is that it's premiering opposite a debate simulcast, a situation in which even Beauty and the Beast looked like a potential hit. Maybe it's not really that bad a fit, since The Flash is fairly light tone-wise, and it's able to bring a bit of its own audience in addition to the casuals who watched during the debate and the baseline audience that leaves on the TV after The Flash. 0.69. It's still retaining barely over half of Flash, but it actually looks kinda deserving of a second season. Worst Case: Last year around the Containment premiere, we asked if it was possible to do much worse in this slot than the incompatible iZombie. Containment may not have really been the perfect test to answer the question, but the offensively incompatible No Tomorrow is. And it doesn't have anything near the critical love of the other CBS Studios dramedies. Yes, it actually is possible to do 0.3's and 25% or worse retention in this timeslot! 0.32. Likeliest: This will be really interesting from a purely academic standpoint; very rarely do you actually see a network create pairings that seem this nonsensical. I may be underestimating iZombie, but I'm guessing it almost can't possibly do much worse than iZombie did, especially if it gets some inflation tonight. Falling to 0.3 with an original lead-in may be out of reach. But iZombie had a few points that were below 0.500 un-rounded, so I think 0.4's will be in the offing pretty shortly. Now, will that be enough to get another renewal for CBS Studios? The problem is it doesn't seem to have quite the huge acclaim of Jane the Virgin and Crazy Ex-Girlfriend. So being CBS Studios will help, but in this case it may actually not be quite enough. Doubting that it keeps this slot the whole season, but in this slot it averages a 0.46. The Flash (1.37 A18-49, 94 A18-49+ last year): The biggest show in CW history will try to make a run at becoming the first CW show to break the big four league average. If it can replicate its year-to-year pace even from just the spring episodes, it will be extremely close. It cooled off a bit from winter to spring trend-wise, so I think it cools off just enough to come up just a teeny bit shy of that mark. But it's still up in Plus again for the season, and once again the biggest CW show ever, which will be a nice consolation prize. 1.27.